First of all, a brief history of the SU Fuel pump. As you all probably know, SU stands for Skinners Union and was the brainchild of George and Carl Skinner. George, in spite of taking over his father's business, Lilly & Skinner footwear distributors, had a better idea for a carburetor in the early automotive days. In addition to building the well known and much loved SU carburetors, they also went into the fuel pump business. They started in the 1932/33 time with the L, low pressure pumps. L (low pressure pumps) — These are found on the T series (TA, TB, TC, TD and early TF) and earlier MGs. HP (high pressure pumps) — These are found on late TF, MGA, Z Magnette and early MGBs. They are the same outline and size as the Low Pressure pumps or sometimes come with a longer coil housing (referred to as a High Pressure/Long Body pump). They develop up to 2.7psi and have a flow rate of 1.1 pints per minute (8.4 gallons per hour). 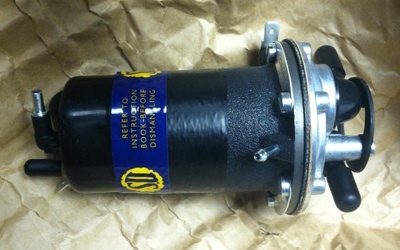 LCS pumps — These were used on the MGA Twin Cam and on the Austin Healey. They use the long coil body of the High Pressure/Long Body pump and have a large, rectangular pump body on them. They develop up to 3.8psi and have a flow rate of 2 pints per minute (15 gallons per hour). AUF 300 series pumps (now AZX 1300 series) — These are found on all of the later MGBs plus many other British cars of the mid 1960s and later. They have what is called a "plain air bottle" on the inlet side and a flow-smoothing device on the delivery side. They develop up to 2.7psi (AZX 1307) or 3.8psi (AZX 1308) and a flow rate of 2.4 pints per minute (18 gallons per hour) for both types. The SU fuel pump is an impulse type of pump. That is, when power is supplied to the pump, current flows through the points and the solenoid coil. The energized coil acts on the iron disk attached to the diaphragm, pulling it and the diaphragm toward the coil. This movement of the diaphragm develops a vacuum in the pump body, which pulls fuel from the tank, through a check valve and into the body. The movement of the diaphragm also causes a shaft that is attached between it and the lower points bridge or carrier to push the carrier up, making the carrier to 'throw over' and open the points. Once the points open, the flow of current through the coil is interrupted, allowing the diaphragm to be pushed back to it's original position by the volute spring, which in turn pushes the fuel in the pump body out through another check valve to the carburetors. Once the diaphragm reaches it's original position, the points carrier 'throws over' to the points closed position and the whole action is repeated - thus the familiar tic, tic, tic sound of the pump. The pump pressure is established by the strength of the volute spring which resides between the iron disk on top of the diaphragm and the bottom of the coil. The check valves can be either a simple brass disk that held against the valve seat by combination of gravity and back pressure in the system in the case of the L, HP and LCS pumps or a plastic sheet in a valve assembly that closes against the assembly's valve seat and is held against the seat by system pressure in the case of the later AUF 300 and AZX 1300 series pumps. In both cases, the system pressure is developed on the carburetor or outlet side of the pump, so the valves act as check valves to keep fuel from flowing back to the tank. As with anything that uses a set of points opening and closing, there is point wear, both mechanical (slight) and electrical arching (major) that eventually causes operation to deteriorate and eventually stop all together. Over the years, various methods were employed to suppress the electrical arching at the points. Originally, on the L type pumps, the only suppressor used was a swamping resistor, in the form of resistance wire wrapped around the coil and attached in parallel with it. As stronger coils that draw more current were employed, a 0.47 microfarad capacitor was added to assist the swamping resistor suppress the arching (by the way, even though it looks like an electrolytic capacitor, it is not and therefore is not polarity sensitive). With the introduction of the AUF 300 and AZX series pumps, the capacitor was replaced with a diode to work in conjunction the swamping resistor. This arrangement made the pumps polarity sensitive. All of the systems of arch suppression worked fairly well with the series of pumps they were designed for, giving the pumps a reasonable life expectancy (except the expectancy of the owners). Finally, the all electronic pumps were introduced, which replaced the points with a Hall effect circuit to control the current flow in the coil. These pumps look and operate the same as the points style pumps, complete with the familiar tic, tic, tic sound, but there is no longer any problem with point wear and the life expectancy of the pumps is now established by the life of the diaphragm and check valves. Burned and/or sticking points - usually causes intermittent fuel starvation and stalling. When this happens, the silence is deafening with the normal tic, tic, tic sound missing. A sharp rap on the side of the coil housing will sometimes bring the pump back to life, but the long term solution is replacement of the points. Diaphragm stiffens with age - this will usually cause the pump to run slowly or erratically. The only solution for this is to replace the diaphragm. Leakage past valves - pump will seem to run at normal or faster rate, but no fuel is pumped, a vacuum gauge on the input to the pump will bounce up and down in time with fuel pump clicking. On the L or HP pumps, this will necessitate new valve disks and/or re-facing the valve seats. On the AUF 300 or AZX 1300 series, one or both of the valve assemblies will have to be replaced. Broken pedestal (bakelite platform under the end cap where the points mount) - this is usually a problem only on the L and HP type pumps where the pedestal is not supported around the mounting screws, and then usually a owner induced failure by over tightening the mounting screws. This condition will stop the pump completely and is corrected with a new pedestal. Fuel leak - caused by loose coil housing to body screws, loose inlet/outlet fittings, split diaphragm or cracked pump body. A cracked pump body is a very unusual situation and with the price of new bodies, the best solution is a new pump. A split diaphragm requires replacement of the diaphragm while loose screws or fittings just requires tightening. It is a good idea to use some sealing compound on fitting threads and lock washers on screws. Air leak - This will usually show up as fuel starvation at higher speeds. To check for this situation, disconnect the fuel line from the last carburetor in line and route it into a jar. Turn on the ignition and as the jar fills above the end of the line, watch for a stream of bubbles. The fix is the same as the above, plus checking the lines and fittings between the pump and the fuel tank. Clogged lines - this can happen before or after the pump. Disconnect the line from the pump to the carburetors and replace it with a line into a jar or can, then turn on the ignition and see if fuel is pumped out of the pump. If so, the output line is clogged. If no fuel is pumped out, disconnect the line from the tank at the pump and turn on the ignition. If the pump runs, the line from the tank is clogged. Note: since a clogged input line will cause the pump to fail in a current on condition, leaving the ignition on for a long period of time in this condition will cause the swamping resistor wire to burn out, which will, in turn, cause excessive arching at the points and a reduced points life. If the pump is an all electronic pump this situation can result in a burned out circuit board which gets into many $$$. Instructions on repair, reassembly and adjustments of the pumps can be found in the shop manual or the Haynes manual for all of the cars. The information on the fuel pumps for the TD is in Section B.2 of the shop manual and section D.3 of the shop manual for the MGB (pre 74). In the Haynes manual for the MGBs it is in Chapter 3 sections 4 through 11. For all the other models, you will have to search your manuals for the information since I don't have the manuals for them. Repair parts for the pumps can be purchased through Moss Motors, Victoria British, or directly from Burlen Fuel. In parting, if you get stuck on your SU fuel pump, or you don’t feel comfortable digging into them yourself, there are a number of us in the US who do SU fuel pump repairs or restorations. Below is a list of the people that I know of who work on SU fuel pumps. If you happen to know of other people who work on the SU fuel pumps, please let me know and I will add them to the list. Note: If you also repair SU fuel pumps or know of somebody not listed above who does, please send me an e-mail with contact information for the person so I can add them to the list of people to contact for fuel pump repair. This monograph may be reproduced only for non-commercial use without other permission of the author. Reproduction for commercial use only by written permission. Comments on "SU Fuel Pumps 101"